Barbour Ambleside waxed cotton jacket in olive green. 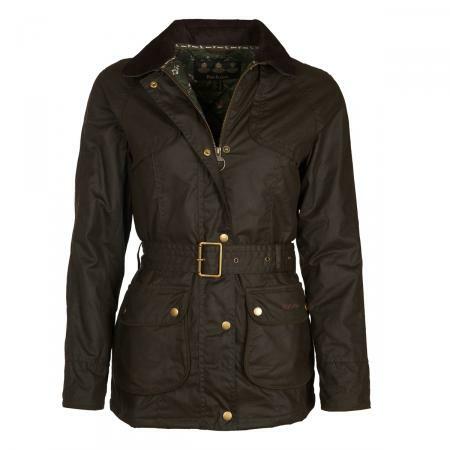 Adding a little feminine charm to your country look, the Barbour Ambleside Wax Jacket features a self fabric waist belt with authentic brass buckle. Not only does this belt offer a neat, nipped in look for a feminine silhouette, but ensures that cold winds and rain storms are kept at bay. This jacket is cut to a relaxed fit, which means you can easily layer up beneath it, and will offer ease of movement for when you're out and about. As with many other Barbour jackets, the collar is a soft needlecord, which offers great comfort around the neck. To the lower half of the jacket, you will find two large bellow pockets to keep your essentials safe and secure. The Barbour Ambleside jacket is finished with a two way zip, press stud closure and signature Barbour embroidery to the pockets.